03 | November | 2014 | Coyote Moon, Inc. The ever-changing storyline of the Broadwell processor launch took a new turn, with Intel quietly releasing new and faster Core M processors that may find their way into Apple’s rumored 12-inch MacBook Air. 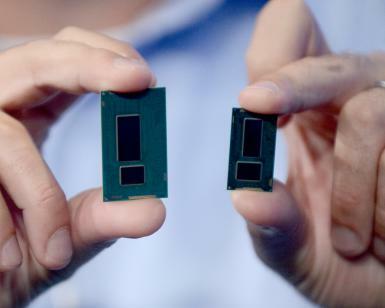 Intel’s Core M series of Broadwell processors are designed for low-power use in fan-less laptops and tablets. Intel’s first release of the Core M series, back in September 2014, didn’t really have the power or graphics that would be needed in a 12-inch MacBook Air, and were better suited to tablets. But the new offerings now available include two higher-end Core M models, the 5Y51 and 5Y71, which could see their way into a new MacBook Air. The Core M 5Y71 is a dual-core processor that can run four threads simultaneously, has an operating frequency of 1.2 GHz, and a turbo mode of 2.9 GHz.